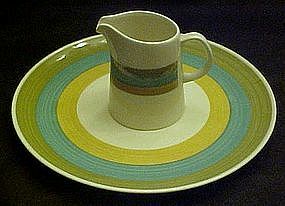 Your choice of the 10 5/8" dinner plates (5) @ $15.00 ea, or the 3 3/4" tall cream pitcher @ $15.00, to this Kasuga dinnerware. Eames era, Riviera, Rainbow #7921. Avocado turquoise and gold hand painted bands on a white background. I will be offering several piece to this great set. All decoration is underglaze. All pieces are perfect unless otherwise noted.